Heat the oven to 400°F. Beat the egg and water in a small bowl with a fork or whisk. Stir the cherries, pecans, honey and rosemary in a small bowl. Unfold the pastry sheet on a lightly floured surface. Roll the pastry sheet into a 14-inch square. Cut off the corners to make a circle. Spoon the cherry mixture in the center of the circle. Top with the cheese. Brush the edge of the circle with the egg mixture. Fold the pastry up over the cheese to cover. Trim the excess pastry and press to seal. Brush the seam with the egg mixture. Place seam-side down onto a baking sheet. 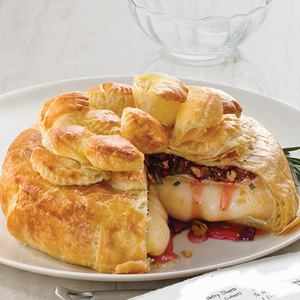 Decorate the top with the pastry scraps and additional rosemary, if desired. Brush with the egg mixture. Bake for 25 minutes or until the pastry is golden brown. Let stand for 45 minutes. Serve with the crackers. Ingredient Note: To soften the cherries, stir the cherries and 1/2 cup hot water in a small bowl. Let stand for 1 minute. Drain the cherries and pat dry. How to Thaw? Thaw time may vary. Pastry should unfold easily but still be cold after thawing. 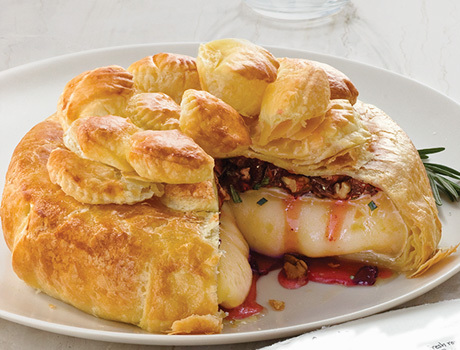 At room temperature, thaw unwrapped pastry for no more than 40 minutes. In the microwave, wrap pastry in paper towel and microwave on HIGH for 15 seconds, then turn it over and microwave for another 15 seconds. If it doesnt unfold easily, microwave for another 5 seconds on each side.